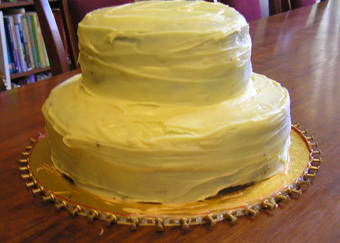 This is a scaled-down version of the bottom half of yesterday’s wedding cake. It’s still enormous. You might halve it again, in fact, andjust make it in one sandwich tin – I made it in a 21cm round springform tin and I thought it would never cook through, but it was certainly very tall when it did. Next time, I’m definitely doing two cakes and sandwiching them together. My sanity requires it. This cake is very rich, and quite solid. It’s dead easy to make, which is nice. It should keep and freeze rather well, and it is definitely strong enough to support another cake on top of it. It also has a flat top, which helps. I suspect that even the 21cm version serves 20-odd people. 200 g dark chocolate. The good stuff. Lindt has an excellent cooking chocolate, that is 70% cocoa solids and I recommend it for this. Grease and line either one 21 cm round tin with very tall sides, or (my recommended option) two 20-21cm round tins. Springform isn’t a bad plan, because this cake is fairly sticky. Preheat the oven to 170°C. Start by melting the chocolate. I do this by breaking it into pieces and melting it in the microwave on 50% for a minute at a time, stirring after each minute. This takes about 3-4 minutes, all up, and while I’m doing it, I start cutting the butter into cubes and weighing the sugars into a bowl with the butter. Set the chocolate aside to cool a little, but not set, of course. Cream your butter and sugar in a larger bowl than you think you will need. Trust me on this. I actually use electric beaters for this recipe, which is unusual for me, but there is a lot of beating and a lot of mixture, so it’s worth it. Mix in the eggs one by one. The mixture will probably curdle, but that’s ok. It will come together when you add more stuff. Switch off the beaters and get a large metal spoon or a sturdy spatula now, because you are mixing in the sour cream and the chocolate, followed by the almond meal, flours and cocoa. Mix together until everything looks pretty homogenous, and then finally fold in the raspberries. Scrape the whole lot into a tin and then, as my Nonna would say, cook until it’s done. I think the rotten thing took 2 1/2 hours in the single tin (and had to be covered with foil after the first hour and the temperature reduced to 160) when I just wanted to go to bed, which is why I would recommend two sandwich tins (plus, that way you can have more filling, which is never bad). Two tins should take about 1 – 1 1/2 hours each, I think – test at 1 hour and you should be right. You are aiming for a cake that does feel solid, has risen more than you might have anticipated, but that can still be a bit sticky in the middle when you do the skewer test. Leave to cool in the tin overnight (which should resolve any questions about whether the cake was cooked through or not, as well as any questions about whether your cats like chocolate cake, if you are foolish enough to leave the cake anywhere accessible by felines. Which I wasn’t, on this occasion, but it’s certainly happened before). If you want to go with the wedding cake option, you can make a lovely white chocolate ganache with 500 g white chocolate (Cadbury, surprisingly, has a really good white cooking chocolate on the market at present) and 250 ml cream melted together in a saucepan and then let cool. I am still highly enamoured of my chocolate, raspberry and coconut ganache, which is two parts chocolate, one part light coconut milk, and one part smashed up frozen raspberries. Quantities? My dear readers, as much as you can fit on the cake, and then some. This stuff is too good for elegantly small portions. If you are feeling a bit less decadent, a dusting of cocoa powder over the top might be nice, and then you could serve each slice with a dollop of cream and some fresh berries. The fresh berries, incidentally, go with any of the options above, too. You could macerate them in raspberry liqueur if you wanted to up the decadence a little. I don’t think you can make this cake eggless, I’m sorry. I do strongly suspect you could make it gluten-free, and would probably replace the 1 1/4 cups of flour and self raising flour with half a cup of quinoa flour, half a cup of chestnut flour, and 1/4 cup rice flour, with a teaspoon of baking powder added, and maybe a tablespoon of tapioca flour, too. Or take out the chestnut flour and add more almond meal. My feeling is that you could probably make this dairy-free if you wanted to, but if I were doing it, I’d start from scratch and make an entirely different recipe, because this is just full of butter and won’t be as tasty with margarine. If you did replace it with margarine, I’d be inclined to add coconut cream instead of sour cream, and reduce the sugar to about 350g in total. Soy yoghurt or soy-based sour cream substitutes might work, too. Or – here’s an idea! – use half margarine and half nut butter – I could see hazelnut, cashew, macadamia or, of course, almond working well here. If you were going nut-free, I’d again be inclined to choose a different recipe, because the almond meal is rather the point, but you could take all the almond meal out and replace it with flour. Or semolina, perhaps? 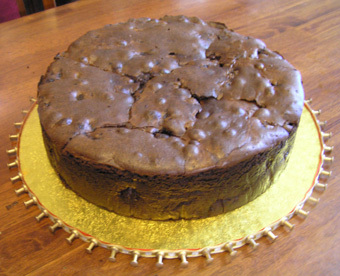 The almond meal gives this cake a nice, dense texture, so you want something to replace that, if you can manage it. This cake is never going to be low-GI or fructose-free, sorry. In terms of flavour variations, an obvious place to go would be replacing the almond meal with hazelnut meal. And maybe the raspberries with blackberries. I don’t know – I still don’t really understand why people eat hazelnuts for fun. It might be interesting to play with ground walnuts, too. I’d be inclined to go a bit Middle-Eastern at that point, and start introducing cinnamon and orange flavours to complement the personality of the walnut. But I would take out the raspberries, too, at this point, and maybe add in stewed quinces or something along those lines. Apples? Pears? Walnuts strike me as an autumn fruit kind of thing, not a berry thing. Incidentally, I particularly *dislike* walnuts, so I have no idea why I have such strong ideas about what it would taste good with. Stick with the original, is my tip. Chocolate, almond and raspberry is a classic combination – why go further and fare worse? 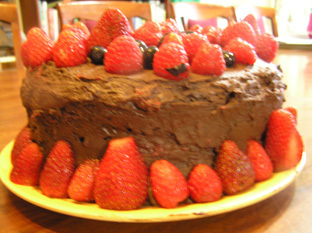 ← Show-Off Post: Near-Disaster Chocolate and Berry Wedding Cake! 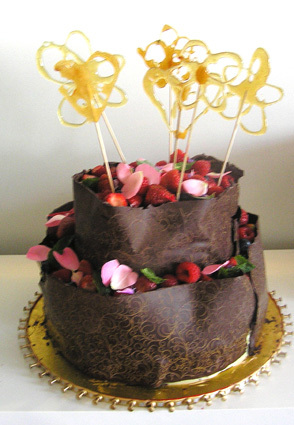 I made this for a birthday tea (my own — but also the poet Lucan’s, so there! ); as cupcakes with the rest of the package of frozen raspberries mashed into vanilla buttercream icing — the result was shockingly bright pink. A 2/3 recipe (why I decided to do two thirds, when I also had to convert sensible quantities by weight into US volumetric, I do not know. But my arithmetic certainly got practice!) made 28 smallish cakes — far more than necessary, as it turns out, especially since I also made a pumpkin cheesecake and a ginger-cake (is this blog rubbing off on me? 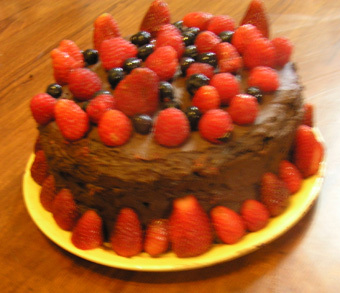 But I’ve always thought that a proper party should have three kinds of cake!) . Anyway, these were by far my favorites ! Oh, overcatering is certainly contagious! Or if it isn’t, it should be!